A dispute between workers at the construction site of the Hinkley Point C nuclear power station in Somerset and energy company EDF has ended. 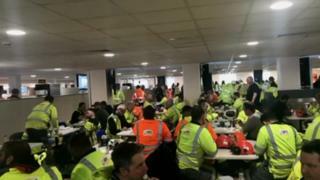 On Tuesday about 600 staff staged a sit-in at the staff canteen, claiming they had not been paid for days when snow stopped work last week. EDF had said the workers were paid at a union-agreed rate. The BBC understands both sides have now reached agreement. Some 2,000 people are working on the site but were sent home on Thursday.